The Global Veterinary Medicine Certificate Program was created to provide PVM students with a complete cross-cultural experience (before, during, and after traveling abroad). The certificate is tailored to give students a better understanding of Global Veterinary Medicine and to prepare them to engage with the culture they are entering. 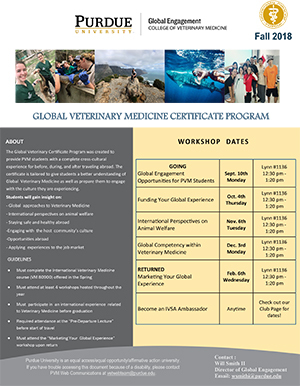 Those who complete the certificate will have a comprehensive knowledge of the global engagement options available for PVM students, various scholarship opportunities available (as well as tips on making their application stand out), safety and health tips for traveling abroad, global approaches to veterinary medicine, marketing their study abroad experience upon return, and everyday information that makes their experience worthwhile. Although, this certificate will not show up on the diploma, it will be a resume booster for future employers. Students can inform future employers that they are not only able to engage globally, but that they have gained organizational, cross-cultural communication, interpersonal, and decision-making skills from this certificate program. Contact the Office of Global Engagement at pvmglobal@purdue.edu to learn more about how to enroll in this program.